The use of the word Association merely serves to distinguish croquet from a version of the game called golf croquet, described elsewhere. If croquet is used on its own it is Association croquet that is being described, and this is the version most people understand the game to be. T he aim of the game is quite simple: you have to take two balls round the course and hit them onto the peg before your opponent. The lawn or court is 35 yards long and 28 yards wide. If you strike your ball so it then hits one of the other three balls you must pick up your ball and place it in contact with the ball it hit. 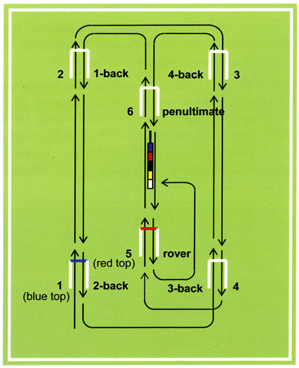 You then strike your ball again to send both balls where you want them (this is called a croquet stroke). You get an extra shot after a croquet stroke, and if in this shot your ball hits a different ball it is followed by another croquet stroke, and so on. Your ball can hit each of the other three balls once between going through one hoop and the next. If you use the extra shot after a croquet stroke to go through a hoop you get another extra shot, which you can use to start the whole sequence all over again. By placing the other three balls in useful positions you can take your ball through a number of hoops in the same turn. This is known as a break, as in snooker. If you want to see how it works, you can open or save the animated Powerpoint demonstration Croquet demo.ppt. If you save the file, click on Slide Show and View Show. Each click represents either a stroke or lifting a ball to position it for a croquet stroke, or, in one case, replacing a ball on the lawn. If you open the file you can play with it straightaway. Plan of the course. The rover hoop is named because a ball that has gone through it has no more hoops to go through and can “rove” around the lawn until the game is completed.